Fabulous Riverbend Community within walking distance to large community sports park and the Santa Ana River trail with bike path. Beautiful cabinets with granite counters in kitchen and both upstairs bathrooms. Stainless appliances in kitchen. Open floorplan downstairs with kitchen island overlooking living area. Direct garage access with electric car charger already installed. Lovely front patio with plenty of room for seating and bar b que. 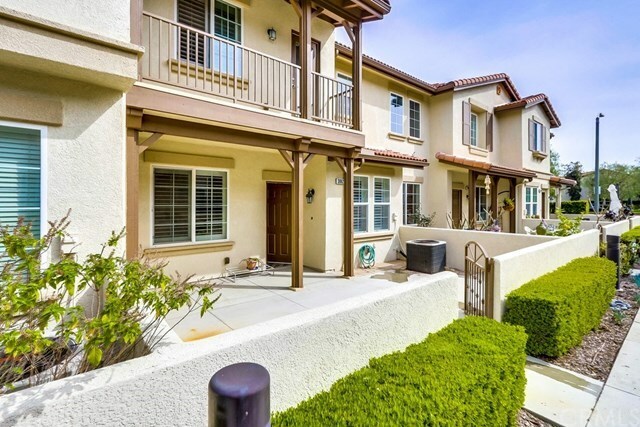 Great balcony off the master bedroom enjoys the neighborhood views and overlooks the patio. Tile floors downstairs and carpet upstairs. All bedrooms are on the 2nd level including the spacious master suite with walk in closet. There is a built in office workstation in a small loft area at the top of the stairs. Separate laundry room also on the 2nd level. Community has pool and spa area and is lushly landscaped, perfect for walking. Just down the street from Old Towne Orange and centrally located between the 91 and the 22 freeways. A little paint and personalization and you will have a lovely homes that feels and looks brand new.